Getting Uncomfortable With The Uncomfortable Chickens Or New York? The posture injury provided us both with a good laugh as well as an excellent example of how far our good posture can fall from our bodies unnoticed. When new clients come in to begin their “change of life fitness plan,” I like to start off by discussing the importance of posture in relationship to our long term health and wellness. 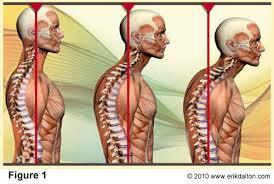 Below you will find an image that I keep on the bulletin board which I use to kick-start my posture lesson. This image has been photographed by many people who never want to forget its message. Did you know that for ever inch forward your 12 lb. head moves in front of your shoulder, it weighs 10 more pounds relative to the body? Take a look at the 42 pound head in the 3rd image, it will continue taking you down, down, down. During my years of working with posture, both good and bad, I gathered simple exercises designing my simple posture program, ACTS. This program is one of the easiest ways to start to correct “rounded shoulders and head forward” posture. After taking a look at her current body alignment, I suggested some simple corrective exercises to strengthen and stretch what has become weak and tight. Enthused, my client took her ACTS program to the streets and sat straight up, chest and head held up, belly in for 3 hours during a musical concert. The next day, she called to say that she had suffered an injury to her chest muscles. 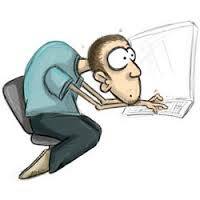 The moral to this story…it’s never too late to improve your posture, resulting in your better health and well-being. Don’t go here: Go Here!